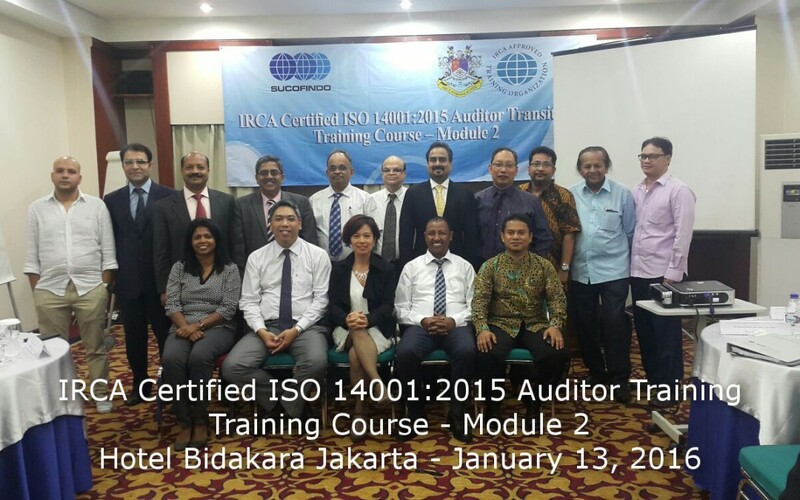 On 13th January 2016, IQCS Certification has organized CQI/IRCA approved ISO 14001:2015 Auditor Transition Training to qualify IQCS’ International trainers. The course was jointly hosted by IQCS’ & its strategic partner Sucofindo in Jakarta, Indonesia, with affiliates from 13 different countries who joined the training and exchange experience in the course. The main purpose of the course is to learn the new knowledge transition from ISO 14001:2004 to the advanced Risk-Based Management requirements of ISO 14001:2015 version. A comprehensive insight of the changes has been provided by CQI/IRCA approved tutors from our Thailand and Ethiopia partners. In addition, the course focus extensively on the Risk-Based Management approach and PDCA auditing processes by stimulating and enriched case studies/ workshops & AL (Accelerated Learning) activities. Delegates had the opportunity to practice Risk-Based Management audit process of ISO 14001:2015 based EMS, through “workshop-based training” using comprehensive case-studies and practical examples, by working in groups.